Cinnafilm’s Wormhole is a unique media retiming solution for file-based workflows, offering a compelling ROI for broadcasters, content owners and service providers alike. As a plug-in for the RadiantGrid transcoder platform, the HPA Engineering Excellence Award-winning Wormhole has two primary applications: Program Retiming and Super Slow Motion. Wormhole provides ±50% runtime adjustment of your media, while preserving video, audio and closed caption integrity. Wormhole can hit your delivery target runtimes — perfectly. Wormhole’s Super Slow Motion allows for up to 900% slow down of assests, of course not all assests are created equally, so mileage will vary. The screenshot below demonstrates the scene-by-scene control of the Wormhole User Interface. You set an overall time adjustment, but if there are specific scenes that need special treatment, you have the power to designate by timecode where those scenes are. The scenes which are set to AUTO will then be shortened/lengthened as necessary to meet the overall time adjustment objective once the special treatments are taken into consideration. 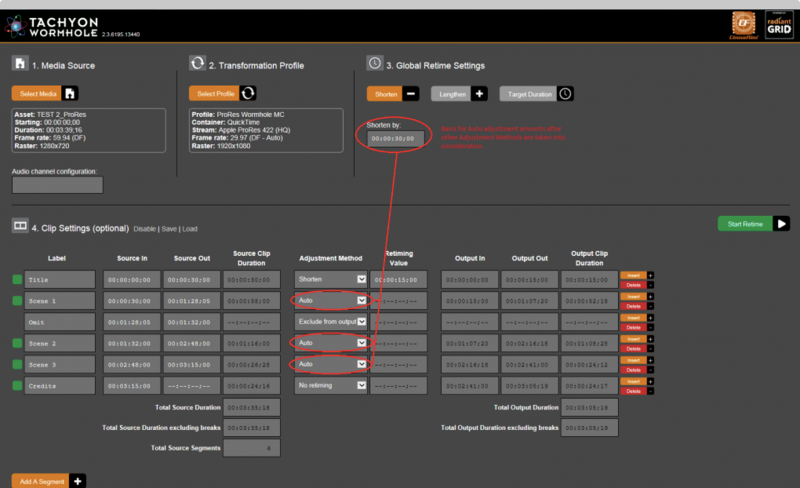 This screen shot is of Wormhole’s global retiming method which simply applies time reduction/expansion evenly to the entire project. Wormhole allows you to dramatically reduce/collapse your workflow by including multiple operations that would typically require multiple renders with other solutions . . .
. . . all in the same render. Spatial: PAL; NTSC; 720p; 1080i; 1080p; 2k; 4k. Frame Rate: 23.976p, 24p, 25P, 29.97p, 25i , 29.97i, 50p, 60p. Color: up to 16 bit 4:4:4:4 via a full-fidelity processing pipeline. Retime based on timecode range. Automatically “fit-to-fill” segment (to meet the target asset duration). Video: Full award-winning motion-compensated processing, re-synthesizes video data to produce perfect pictures. No dropped/doubled/blended frames, no stutters! Audio: Full, non-destructive, retime and audio pitch correct of up to 64 channels results in perfect audio. Caption: Retime support for 608/708 inside SMPTE 436M and QuickTime. For more information on how to make Wormhole a part of your workflow, contact sales@cinnafilm.com.